The new branding is announced after a two-year brand evolution collaboration with Nike and honors the University's tradition of academics and athletics. 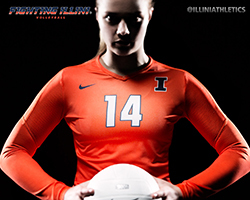 April 16, 2014 - CHAMPAIGN, Ill. - The University of Illinois Division of Intercollegiate Athletics, in partnership with Nike, today introduces a new brand and identity system that sets the visual direction for Fighting Illini Athletics for years to come. The updated identity provides a fresh look for one of the most storied brands in all of intercollegiate athletics. Illinois and Nike collaborated on a nearly two-year brand evolution program to enhance and expand upon the celebrated marks of the university, honoring the history and integrity of academics and athletics, key characteristics associated with the Illinois brand. With the goal of developing an innovative and consistent athletic identity that pays tribute to the university's legacy and tradition, Illinois and Nike worked with student-athletes, coaches, administrators and alumni throughout the process. 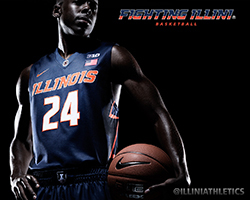 The end result is a visual hierarchy that plays off the brand attributes of the Fighting Illini. As part of the new program, all 19 of Illinois' intercollegiate sports teams will showcase consistent colors, logos, lettering and numerals that will debut with the football and basketball programs in 2014-15 and gradually expand across all sports in the upcoming seasons. "When we first approached Nike regarding this project almost two years ago, we knew we would get the finest effort from t he very best group for what we were trying to accomplish in freshening the Fighting Illini brand identity," said UI Director of Athletics Mike Thomas. "We are extremely pleased with the results that the Nike team produced. They worked very closely with our student-athletes and coaches throughout the process to get the perspective of young men and women, along with our coaches who are recruiting prospective student-athletes to attend the University of Illinois. The end result is a consistent look for all of our programs that helps tie in the long history of the Block I, with a modern touch." The "I" logo will remain the primary representation of the brand and serve as the main identifying device for athletes. The overall proportions of the letterform have been slightly adjusted from the previous version, with a decreased weight of the body (vertical) stroke and increased weight of the cross (horizontal) strokes. The connections between the strokes have evolved to tie in with the custom alphabet and numeral set, which features subtly curved joints. 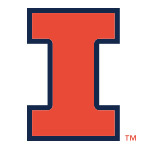 In addition to the updated "I", a custom alphabet and "Illinois" and "Fighting Illini" logotypes have been created for use across all sports teams. The oblique letterforms are inspired by the speed and elusive lateral movements synonymous with Red Grange, one of the most celebrated athletes in Illinois Athletics history. The split color design nods to the concept of duality in the school's motto, "Learning and Labor," and represents the state of Illinois as a crossroads between East and West. The primary logo and typography now work in support of one another while playing off the University of Illinois Athletics attributes of Tradition, Pride, Loyalty, Family, Honor and Passion. Read more and see photos at FightingIllini.com.